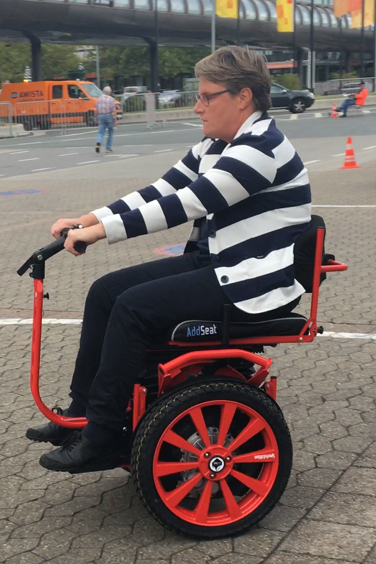 Persons with blindness und deafblindness are driving seated Segway (AddSeat). Presentation of the results from test runs with blind and deafblind test persons at the SmartAccessibility during the DigitalWorld 2018 conference in Rome. The photo depicts one of our blind test persons outdoors in a full stop emergency brake action. With or without restrictions - driving the AddSeat is fun for all. The AddSeat has proven in many cases to be the perfect vehicule for people with physical restrictions - indoors as well as outdoors. The aim of the current BNI research is to investigate the capabilities of seated Segways for people with sensory restrictions, too. The results of the first test runs with blind and deafblind people will be presented during the SmartAccessibility 2018.